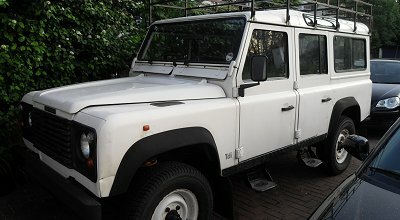 So I find myself a year later in 2010 going back on my previous thoughts about what I want from an expedition vehicle. I've just bought a 1997 300Tdi 110 Station Wagon and am feeling quite pleased with myself. It scored 6.5 out of 7 on the requirements list for my perfect starting point for an expedition vehicle. My Hardtop always felt a bit temporary. It was at the lower end of the Land Rover value and with over 200k miles, was starting to wear a bit. Along with the holes in the bulkhead, it didn't feel like the sort of vehicle that i'd want to use as a base to create an expedition vehicle. For the most part, it's great for carrying lots of stuff (i've done a few trips to the dump for friends recently) but it really can't deal with passengers. Having bench seats would shoot my insurance premium through the roof, so i'm stuck not being able to use it when not on expedition! So i've gone for a Station Wagon because of its versatility. I can use it like a car in the UK and still load it up for going overseas. I've also hankered after a 300Tdi as it feels like a more refined engine. I have most the experience with this engine and the 200Tdi, whilst easy to work on, seems like it came off a tractor. My choice of the late 90's spec is purely down to the lack of electronic controls of the Td5. The Td5's do have a fairly reliable reputation these days but I have no experience with them and would rather stick to what I know. The bulkhead and chassis are good, the mileage around 140k and has been looked after. In all it's taken me 8 months of searching but i've finally found what i'm looking for, 160 miles from home. Getting the right vehicle for you is well worth waiting for.